This week I was out with friends and I was immediately captivated with one of my friends sweater. He was wearing a natural alpaca wool sweater with a clean design. This friend always has great knits and I realized that most of what I look at is designs that are made with women in mind. My friend inspired me to make an effort to widen my pattern inspiration to be more inclusive for the men who also love to knit and wear handmade knits. Below is a small sampling of great knits for him. Enjoy and happy knitting! This classic scarf design never goes out of style. 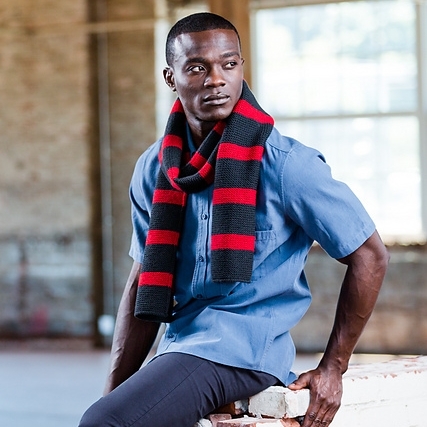 Add a pop of color with a neutral, and this scarf is perfect for the everyday winter wear. Cozy up with some texture with this 'linen stitch' crochet scarf. This stitches up with a woven look. Keep it neutral for a refined look, or play with color for a unique scarf! Everyone needs a good cardigan in their closet and this one does not disappoint. With clean, simple lines, and ribbed edges, this will be a go to for fall and winter! Crochet takes on cables with this classic winter sweater. I suggest keeping to a solid color to let the texture of the cables shine through!